Helen “Ann” Thaxton-Smith, age 82, passed away at her home in Auburn on Wednesday February 6, 2019. She was born on March 20, 1936 in Buckingham County, Virginia. She was preceded in death by her parents, John and Mary Atwater, and ten of eleven siblings. She is survived by her youngest sister, Myrtle Arnett of Florida. Ann was also preceded in death by her first husband of 46 years, Donald Thaxton, and four of his five siblings. She is survived by his sister Ann Crafton (Paul) of Kentucky. She is survived by her loving husband of 4 years, Bob Smith; her four children, Donnie Thaxton, Donna Oliver, Diane Thaxton and Daryl Thaxton (Angela); nine grandchildren; and eleven great-grandchildren. 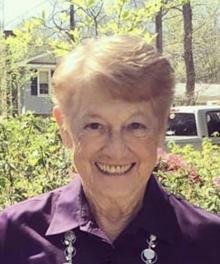 When not spending time with her growing extended family, Ann enjoyed playing tennis, square dancing, gardening, church activities, running, volunteering, cooking, and cheering-on her Auburn sports teams. Many close friends were made as she spent time doing the things she loved. This includes life-long friends from Virginia, Buddy and Mary Page Gregory and Leo and Dot Seal. Memorial service will be Saturday, February 9, 2019 at 1:00 p.m. at Grace United Methodist Church (915 E. Glenn Ave) in Auburn with Reverend David Camphouse officiating. The service will be immediately followed by a celebration-of-life reception in the fellowship hall. In lieu of flowers, please make any memorial gifts to Grace United Methodist Church, Susan G Komen Cancer Fund, or a charity of your choosing. Memorial service will be Saturday, February 9, 2019 at 1:00 p.m. at Grace United Methodist Church (915 E. Glenn Ave) in Auburn with Reverend David Camphouse officiating.